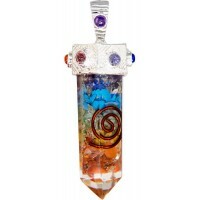 Gemstone pendulum for healing and divination features 7 chakra gemstones great for aligning and cleansing the energy centers of the body. 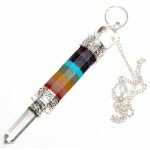 This pendulum measures 2.25 to 2.75 inches in length and is anchored with a white metal 7 inch long chain to an end bead. It has clear quartz at bottom and top with silvertone findings (lead free). 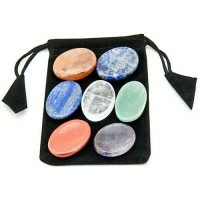 Please note that pendulums are hand made in India with natural stones and their sizes, stones used and colors may vary. Item Number: OI-PND358 | Approximate Size (Inches): 0.50 wide x 0.50 deep x 2.75 high | Approximate Shipping Weight: 0.25 lbs.